When it comes to engineering, the discipline of mechanical engineering is probably the broadest because of how much it encompasses. A mechanical engineer touches virtually every aspect of automobiles, aerospace, computers, automation, and almost every other industry you can imagine that has moving parts. Yes, including humans. So, when thinking about going into mechanical engineering, you’ll have to eventually turn your focus toward a particular niche or aspect of mechanical engineering. From there, you’ll need to decide where you want to apply it, whether it’s in medicine, law, business, or a variety of other career choices. In the meantime, we will look at mechanical engineering as the primary profession and break it down for you from there. For every need known to humankind, mechanical engineers are working to create the technology for it. Climate, health, transportation, you name it, a mechanical engineer is on the case. From macro to nano-technologies, some of which hasn’t even been thought of yet, you have mechanical engineers to thank. By using their extensive knowledge in design, materials, and manufacturing, our world propels full steam ahead. Hey, and speaking of steam, the steam engine was invented by a Scottish mechanical engineer named James Watt. According to Merriam-Webster, the definition of mechanical engineering is a branch of engineering concerned primarily with the industrial application of mechanics with the production of tools, machinery, and their products. It’s a noun, by the way. To break it down into a more understandable language, mechanical engineering is to every moving part what gasoline is to a car (for now). It makes things work. Learn about mechanical engineering technician and more. Depending on where you work as a mechanical engineer will determine your day to day. It’s such a diverse field, mechanical engineering. Say you decide during your schooling that you want to take your love of coffee and transfer it to creating the perfect coffee maker. Your day will look incredibly different than someone who is focused on car parts or fluid mechanics. Because careers in mechanical engineering are so diverse, there isn’t a real reliable daily schedule of job to-dos. Most mechanical engineers work among a team, each person having his or her own unique place, with tasks interrelated yet sometimes separate. As a mechanical engineer, you won’t be a stranger to massive amounts of emails, telephone calls, meetings, and other ways teams and partners stay connected when working on a project. Oh, and it must be mentioned that many mechanical engineers dedicate a significant portion of their time to the preparation of proposals. You may be working in an office setting, using computer aided design (CAD) technology. Or, you could be in the “field,” working in the oil or energy industry. Your work setting will be as varied as your daily tasks. One thing is constant across the entire field, there is a problem to be solved, and that’s where the mechanical engineer begins the day. Solving a problem. Will I Make A Good Mechanical Engineer? Let’s be honest here, if you’re planning on going into mechanical engineering because of the paychecks, then maybe you should rethink it. It’s a very involved career, and if the only motivating factor is money, then you probably won’t be as successful as you would be in, say, the financial sector. You’ll know it; you’ll feel it if mechanical engineering is part of your destiny. Or, maybe you’ll just discover early on in your college career that art history will be put on hold—you’re thinking of becoming a mechanical engineer! Engineering, and Mathematics are all part of mechanical engineering. So first of all, you have to determine whether or not working in a STEM career is something you can live with. If you’re nodding your head yes, then you’re good because you have the desire that is necessary to get ahead in this career. However, excelling in mechanical engineering goes deeper than love and understanding of the core STEM principles. You have to be able to creatively problem solve within the perimeters of your project. You’re designing or building complex thingamabobs: You need to possess the creative vision, as well as the problem-solving tactics to overcome any potential roadblocks. Math, physics, they’re your favorite subjects! Which is excellent because you’ll be using them an awful lot throughout your career. You enjoy team sports. Not that mechanical engineering is anything like a sport. The only similarity is the team part. Because you’ll be a part of a team, you’ll have to collaborate and communicate. Insert all the “there’s no I in team” cliches here. A forever student. Our world and the way we connect with things, they are constantly changing. The same holds true with mechanical engineering. The tools and technologies used in your field will evolve, so you’ll need to stay on top of the trends by being a perpetual student. To have a career as a mechanical engineer, you must have, at the very least, a bachelor’s degree. So, you’ll need first to graduate high school or get your GED. In high school, your focus should be on math and science, as well as humanities and computers. Take a heavy math load including geometry, trigonometry, algebra, calculus, physics, chemistry, and biology. You’ll need to be sure that you’re looking at schools with a program accredited by the Accreditation Board for Engineering and Technology (ABET) when it comes time to apply to college. Accredited programs are important to hiring managers, especially for your first couple of jobs. After that, your experience may speak louder than your degree. There is another option, but you’ll still need your high school diploma or GED, and that’s to get a two-year, pre-engineering degree so you can work as a mechanical drafter before transferring to a four-year program. A bachelor’s degree program typically takes four years to complete, and sometimes it can take a bit longer. Through the mechanical engineering curriculum, you’ll learn the essential elements necessary to getting your license. Yes, you’ll need a license. From the designing through the manufacturing, you’ll have a full range of knowledge how it all works. You’ll design, test, and even manufacture, as well as learn the tools of your trade. Examples of classes you’ll take are Intro to Engineering, Product Realization, Metals Selection, and Heat Transfer. Although not entirely necessary, master’s degrees are available. They are good for those who want more advancement opportunities or to specialize further. These master degree programs generally take two years to complete. The curriculum usually includes courses such as Product Definition, Simulation Modeling, Experimentation, Patent Law, and Project Management. Specialized Areas: Biomedical, Design and Innovation, Transportation Systems, Robotics, Nanotechnology, Design and Development, Biomedical and Engineering Fluid Mechanics, Combustion and the Environment, and more. To work as a professional engineer, you’ll need a license. Each state happens to have a different set of requirements. However, the necessary steps needed to reach the licensing stage are similar. Exam: As you get close to graduating with a bachelor’s degree, you’ll have to take the Fundamentals of Engineering (FE) exam. You’ll have to pass this before you can even be considered qualified for taking the Principles and Practice of Engineering exam, which you have to have to become licensed. Intern: Once you have graduated from your accredited program and have passed the FE, you can become an intern or an engineer-in-training (EIT). It’s the first step toward getting your license. Experience: You’ll work, for four years, under the eagle-eye of a professional engineer. Your school will help you find an appropriate internship. Licensing Requirements By State: It’s a good idea to familiarize yourself with the requirements for your state. We will go into more state-by-state detail further on in this article. Preparation: This is the final step you’ll take before taking your state’s Principles and Practice of Engineering licensing exam. There are all types of online and in-person study courses available. Weigh your options and do what’s most convenient for you. Ace the exam! Some states may require you to keep your licensed renewed yearly, and most states will honor a license from other states. It’s as fast as average when it comes to mechanical engineering job growth. However, and this is sort of a big HOWEVER, if you’re a mechanical engineer in the actual engineering services sector, then you’ll experience must faster growth because there’s this whole race to develop the new generation of vehicles and vehicle systems. Also, if you’re in the alternative energy, remanufacturing, and nanotechnology sector, those specializations will be seeing some pretty substantial growth, as well. Mechanical engineers make a great living. Entry level earns over $55K, and the top 10% make more than $130K annually. The median annual range, or the national average, for mechanical engineers is $85K, as reported by the Bureau of Labor Statistics. Mechanical engineering careers provide high job satisfaction, while maintaining an average stress factor. 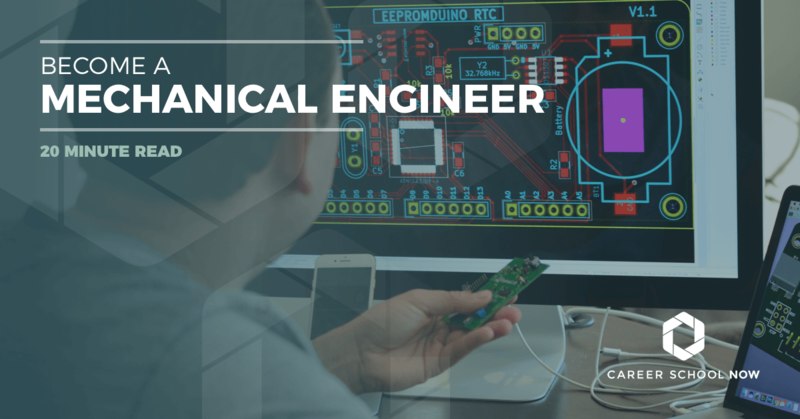 So, if you’re a naturally curious person who enjoys solving problems to help your fellow man, then mechanical engineering may be the right fit for you.